We have begun to explore different possibilities that are facing humanity at this time. We are looking down different timelines and seeing what is in store for you as a collective if you decide to traverse those timelines. And we are here to inform you that there is one particular timeline that looks very enticing from our perspective. So we are just going to suggest that you pursue the timeline in which you feel the emotions deep inside of you to the point where you come to a tipping point in the degree to which you feel compassion for one another. On this particular timeline, that compassion leads to the forgiveness that is also a necessary part of your evolution and your ascension. And so you see, when you take that approach to life you are not reliant on governments making big announcements about aliens and UFOs, criminals in large organizations that you might call a cabal or illuminati being brought to justice, and your futures are not dependent upon the big oil companies granting you access to free energy. 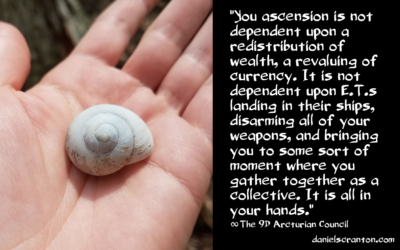 Your ascension is not dependent upon a redistribution of wealth, a revaluing of currency. It is not dependent upon E.T.s landing in their ships, disarming all of your weapons, and bringing you to some sort of moment where you gather together as a collective. It is all in your hands. If you choose the timeline that involves your accessing your deepest and darkest emotions so that you can feel compassion for anyone and everyone that you come into contact with, you can make this ascension process easy and even enjoyable. All of those other eventualities that we have mentioned can only occur when you recognize that none of those individuals, whether they be your nemeses or your heroes, are separate from you. None of them are outside of you, and when you wake up to this knowing, you can live in the world that you want to live in. But as long as you deny these aspects of yourself exist and you deny the pain that comes with that acknowledgement, you will delay that inevitable moment of ascension. That is why we are suggesting that you feel into that timeline and that you choose it for yourself as an individual, taking as many willing participants with you as you can.